have proved a basic level of skills. It is an international academy with the main tasks of research and education, always aware of ethical aspects that concern the human-equine relationship. members of a brain pool where they in exchange help each other to develop. To the members of the Knighthood riding is art of living, giving quality in life to both man and horse. We want to reach the highest possible level, without neglecting the rules of nature. Using systematic gymnastic exercises to promote the horse’s physical and mental well being. Using dressage for the horse, not the horse for dressage. Looking upon dressage as an art that offers horse and man a task in their life that can be performed with dignity until a great age. Honouring the art of riding. Enlarging the circle of those who are dedicated to this art. 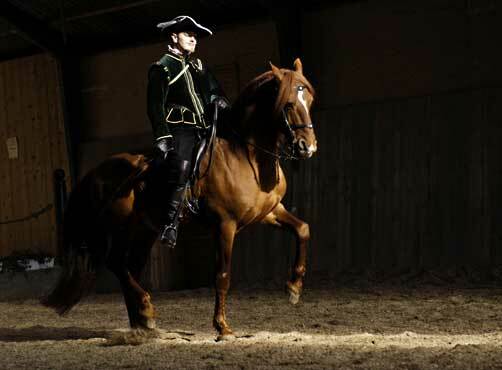 The ideal of the Academic Rider is to ride the horse mainly from the seat, making the horse light in the front and lowering the haunches, while the horse is always long in the upperline, searching forward-down to find light contact with the rider’s soft feeling hand. The rider is leading the horse’s hips between his legs and its shoulders between the reins. The curb is used with one hand only. Its main purpose is to keep the horse supple. The skull is placed in a position to the hip, so that the shape of the spine between the scull and the hip is able to enter a continuous flexion, in a state of relaxed activity. The two minds want to do what the two bodies can do. The examinations that can be taken within the Knighthood are to be seen as a part of it’s educational program. A test is a prove of knowledge and skills at a certain time. The different examinations include the most difficult demands possible, up to the airs above the ground. The members of the knighthood should be willing to support it’s agenda and therefore show the interest to continue in their own development as a rider and an educator of the horse and to support the necessary research. A single examination is not suitable to judge a riders interest and abilities. Therefore the active membership in the knighthood has to be updated every 5 years. The Knighthood contains different positions. To make the squire test the applicant must have done the groundwork/lungeingtest and be recommended by a member of the knighthood who also introduces the applicant at the round table of the year. If no one votes against, the applicant can become a member of the knighthood. If an applicant can not come to the Round Table of the year for a good reason, then he/she may come in the year after, but the 5-years-rule counts from the year of the round table that was skipped. The examinations can be seen as stepping stones in the personal development, they can be markstones on the road to the (higher) level of artistry. They are meant to give orientation, but not to earn a symbol of status. Therefore the status of a squire or knight is a temporary status that has to be updated. A squire or knight who is not able to pass the next examination or to repeat the last examination within the timelimit set, stays a member of the Knighthood but loses the status of a squire or knight. He or she can reactivate the membership with a squire or knight test and thereby earns the status according to the test. All members of the Knighthood meet at the round table of the year. To be allowed to take a groundwork-/ lungeing test you must be recommended by a member of the knighthood. Someone who has taken the groundwork-/ lungeing test is not a member of the knigthood but is an applicant to the squire test. The horse participating in the groundwork/lungeing test must be at least 5 years old. Basic examination, presenting the horse with the cavesson on the lunge line with a wooden hand whip, according to the principles of the Academic Art of Riding. The test is about showing:A good communication with your horse. That your horse understands the aids and is willing to respond. That you can use the aids to help the horse find a good suppleness, shape, balance, tempo, rhythm and schwung within the exercises. That you recognise these qualities in an exercise. Halt on the centre line, greeting the judge. In standing shoulder-in to the left, quarter-in with a little halt. In standing shoulder-in to the right, quarter-in with a little halt. Forward in walk on the center line, at the end to the right. Diagonal: forward down, bending to the right, at X change the bending. Short side: collection in left bending. Next diagonal: forward down, bending to the left, at X change the bending. Short side: collection in right bending. Next long side: quarter-in forward, collection, forward, at the end straigten up the horse. Next long side: shoulder-in forward, collection, forward, at the end straigten up the horse. Next long side: few steps shoulder-in, then travers to the center line, collection, half pirouette, forward, travers back, collection, renvers through the corner. Short side: change the bending. Next long side: few steps shoulder-in, forward, travers to the center line, collection, half pirouette, forward, travers back, collection, renvers through the corner. After the change of bending: change into lungeing position and go into the walk on the right circle. Transition from walk to halt. In halt: change from lungeing to long reining position, take a quarter in halt, ask a shoulder in forward. Transition from halt to walk. Show the following transitions in this order: walk – trot, trot – walk, trot – halt, halt – trot, trot – canter, canter – trot, trot – walk. Change the lead through the circle and repeat everything on the left circle. You can only take the squire test when you have already taken the groundwork-/ lungeing test, but it is not until you have been introduced to the Round Table of the year by the person who has recommended you, that you become a member of the knighthood. A squire is allowed to speak and vote at the round table. Squires will be named on the website, with the whip decoration including gold rings. A squire has to keep him/herself updated after the 5-year-rule. This means that within five years after the examination and within five years interval after this, the squire should be able to take the knight examination or a ring test. Otherwise he/she needs to repeat the squire examination in order to stay a squire. If he/or she can not update him/herself within this period he/she will stay a member of the knighthood without voting rights. If the examination can not be taken by the squire he/she may ask for dispensation at the Round Table of the Year, in which the examination should have been made. The horse participating in the test must be at least 7 years old. The test is a test on the seat as a primary aid. All other aids used are secondary aids, being secondary to the seat aid. Cavesson combined with a curb. Cavesson combined with a snaffle bit. The curb bit with one rein attached to the upper part of the bit, one rein attached to the lower part of the bit. Cavesson combined with a neck rein. Snaffle bit combined with a neck rein. If you want to ride the examination with different tack consult the judge beforehand to ask for dispensation. Note that you must be able to explain why your tack is the best option for you and your horse. The squire/knight is allowed to speak and to vote at the round table. Squires/Knights will be named on the website with their whip decoration including gold rings. It is expected that the next level will be reached within five years after each examination. Otherwise the member of the knighthood can repeat an already taken examination, to prove that at least the level of handcraft is still kept. If he or she does not update, he/she will stay as a member of the Knighthood without voting rights. If the examination can not be taken by the member he/she may ask for dispensation at the Round Table of the Year, in which the examination should have been made. Only when the member reaches the level of a Master it can be kept for a lifetime. Those who can not keep their status as a squire or a knight are still members of the knighthood. Every member of the knighthood can recommend a squire and is allowed to speak at the Round Table. He/she has no voting rights at the round table of the year. He or she can reactivate the membership with a squire, knight or ring examination and thereby earns the status according to the test. Members who want to take an examination, has to prove the basic level first. – On a long rein. The Gold Ring examinations may (but need not) be taken with the same horse. The piaffe is the basic for all other higher movements. Therefore, with the exception of the canter examination, it must be part of every Gold Ring examination. Passive members who want to take the examination have to prove the basic level first. The applicant must have taught the horse the movements on his/her own, or with the help of his/her teacher, after the principles of the Academic Art of Riding. Violation of these rules can lead to the loss of the Gold Ring. Loose contact, the weight and impulsion carried on the bent haunches, rhythmical, elastic, to the left and to the right transitions from and to school-halt, school walk, school trot, school canter and half pirouette. Straight on the centre line, one unbent piaffe towards the judge. The weight and impulsion carried on the haunches, rhythmical, majestic, transitions from and to the Piaffe, bent straight, 10 meter circle and halfpass. Everything shown to the left and to the right. Full pirouette, series changes, all side movements: shoulder-in, travers, renvers, halfpass, collection and extension, everything shown to both left and right, halt. Presentation of a horse carried 100% on its haunches by lowering of the haunches from and to the piaffe. The forehand should be lifted as little as possible. (Below 45 degrees.) The horse should stay in the levade for a moment. The underneck shall not be seen, both hindlegs and both front legs in the same height in the same angles. The hindlegs shall not be wide. The knight must show a levade to the left and right and straight on the centre line, one unbent levade towards the judge. Originally the terre à terre was the war gait where the horse was movable in all directions and tempi. Transitions from and to piaffe, shoulder-in, travers, half pirouette, everything shown to both sides. Straight on the centre line, one unbent terre à terre (mezair) towards the judge. The definition of any school jump is the landing on the hind quarter and it can be developed from piaffe or levade, or terre a terre or mezair. The horse ridden in the examination must be self-trained. If the horse was trained only partially by the rider, he/she must let the judge know. The applicant can be accepted only if the judge is convinced that the applicant is riding at a level showing that he/she could now train a horse completely on his/her own. The training of the horse is more important than the quality of the performance in the examination that day. Therefore, the effort put into training a difficult horse should be appreciated as much as a perfect examination performance on a good horse. The reins are held in one hand only. The right hand is holding the wooden whip straight up, with a slight angle going forward-left. The whip can be briefly used as an addition to the secondary aids and lifted up to its position again. Spurs may be worn but used as little as possible. The theoretical part of the examination is based on the videos and books by Bent Branderup, Guérinière and Steinbrecht. Based on this theory the applicant must judge his/her own as well as the horse’s strengths and weaknesses. Weaknesses in the practical part of the examination can be made up by strengths in the theory. The theoretical examination should be seen as a conversation between the judge and the applicant, giving the judge the opportunity to get an impression of the theorethical knowledge of the applicant. A knight who has passed all the Gold Ring examinations, can take the examination to be a Master of the Academic Art of Riding. A public 30 min lecture on a relevant topic chosen by the applicant himself/herself. A freestyle with appropriate music, including all elements of the knight examination and the 3 first Golden Rings. Should one or more of the movements fail, they can be repeated upon approval of the judge. In addition the judge can also ask for repetition of one or several movements at the end of the freestyle. The master examination is judged by the Grand Master personally. When the knight reaches the level of a Master it can be kept for a lifetime. The Knighthood of the Academic Art of Riding belongs to the Grand Master. He/she is in charge of place(s) and time(s) of the examinations and the Round Table of the Year, chooses the Table Master and presents the silver whip decoration and the Gold Rings to the knights, Masters and Superior Masters. The Grand Master himself/herself functions as a judge at the examinations or chooses judges from the circle of Masters and Superior Master. He/she is supposed to listen to the knights opinions in all matters, yet he/she is in the position to make his/her own decisions, even against the opinion of the knights. All positions within the knighthood can be awarded to respected people. The Table Master is chosen by the Grand Master to arrange the round table of the year. The Membership in the Academic Art of Riding is for life. The costs are therefore high to cover every knight’s cost during his or her lifetime. The entrance in the Knighthood should be well considered, not just a momentary idea. If a member wishes to leave the Knighthood, the knight sends his or her silver whip decoration and the silver pin to the Round Table of the Year together with a request for leaving the Knighthood. At the Round Table of the Year the knight will be struck from the Book of Knights. The silver whip decoration and the silver pin´s value will be refunded a total of a 100 Euro and for each golden ring 40 Euro. Reasons for being excluded is provable animal cruelty or bringing the Academic Art of riding in miscredition. If there are well grounded suspicions or proof the accused member is summoned to the Round table of the Year. Here the member has the opportunity to defend his or her case. A united Table or the Grand Master can exclude the member. If excluded, the member must return his or her silver whip decoration and the silver pin at the Table and is struck from the Book of Knights. The silver whip decoration and the silver pin´s value will be refunded a total of a 100 Euro and for each golden ring 40 Euro. Academic Art of Riding means to bring the Historical Art of Riding from the past back to life again. The horse must be trained according to its abilities, concerning both body and mind. Thoughtful gymnastic exercises will keep horses healthy and long living. The academic riders see riding as an art form, an art of movement like ballet. The basis for this kind of riding, however, is good basic training, like the training of a working equitation horse.